Founded in 1938, and headquartered in Velvary, Czech Republic, Metal Trade Comax a.s. is a well established European wide metalworking company. Almost 30,000 tons of aluminium cast alloys and several hundred tons of copper alloys are produced each year in the modern Czech plant alone. In other locations, different sectors of the company produce semi-finished products from sheet steel. Amongst others a coil coating plant is operated. The decisive basis for constantly good results according to Peter Bružeňák, head of sales for the aluminium sector at Comax, is on the one hand his experienced head of production who knows exactly how the correct charging of the material must be carried out. On the other hand, he needs good, utilisable aluminium scrap, which is delivered in many varying forms. “We use dross, sheets, foils, profiles as well as our own cast and lump scrap and buy aluminium chips of varying quality. The latter makes up more than half of our raw materials. So it is vitally important to deal professionally with the chips” explains Bružeňák. What the engineer means by that is easy to understand when the supplied chips are examined: they contain, on average, more than 15 per cent residual moisture mainly in the form of cooling lubricant residuals as well as fine particles (< 0,4mm). Furthermore they sometimes have mechanically free iron content. Therefore, a structured process of chip processing is very important for the Refiner. Before the chips can be delivered to the well-organised store, they undergo several stations of chip preparation (not part of RUF’s scope of delivery). Upon delivery, the quality is controlled first. This is carried out by measuring the moisture and then doing a spectral analysis. Then the chips are put through a sieving station to separate the rough particles and afterwards they are put through a shredder, which breaks up all long aluminium chips. The first reduction in moisture content is then achieved in a centrifuge. This is necessary to ensure that afterwards a strong magnet can reliably remove the free iron content. Now they come to the last and most important step of the entire process; the briquetting. 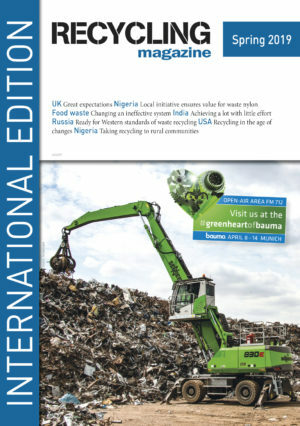 It is now more than ten years since Metal Trade Comax purchased its first briquetting press as it was noted feeding of loose chips lead to high losses in yield. The results of the melting process were markedly better afterwards. Only the reliability and quality of the system left a lot to be desired according to Peter Bružeňák: “Our technicians therefore began the search for a high quality briquetting technology and made comparisons between systems offered by various manufacturers. In the end they were convinced that the machines from the innovation leaders, RUF from Zaisertshofen in Bavaria, were the best match for our requirements. And this opinion has proven itself correct up to the present day”. MT Comax acquired the first RUF Briquetting system RUF 75/2500/150, in 2014, which can press up to 1.5 tons of aluminium per hour. As the advent of available loose chips increased constantly, an expansion was necessary after three years. The manufacturer who should deliver the system was crystal clear this time around, and therefore the company invested in a further system, the RUF 90/2500/150 in 2017, with a capacity of up to two tons of aluminium per hour. The processing capacity of the complete chip preparation system lies somewhat lower than this, but the systems provided by RUF provide a total briquetting capacity of up to 3,5 t/hr . The designed set-up of the system as well as the high hydraulic pressure of 2500 kg/cm² are decisive for the high quality of the briquettes created. Andreas Jessberger, head of sales at RUF describes the process: “Through the enormous pressure, the loose aluminium chips are pressed into solid briquettes, whereby the residual clinging moisture left over after the centrifuge is almost completely removed.” This is a fantastic result for Peter Bružeňák, who calculates the remaining moisture in the briquettes in his plant as being under three per cent. Furthermore, the high density of the briquettes of around 2.2 kg/l is extremely important for the optimum yield from the melting process. Subsequently the RUF system feeds the finished briquettes via an outlet rail directly into the collecting container, which is emptied at regular intervals. “Because our machines have additionally an automatic feeding system, the personnel requirements for MT Comax are minimal” continues Jessberger. Only the maintenance has to be carried out by trained service employees from the Czech company. The effort required here is hardly worth mentioning, according to Peter Bružeňák. The machines consistently run without problems. On the basis of comprehensive experience, the head of sales, Bružeňák and his melting foreman agree that the investment in the briquetting presses has paid off in several respects: “One is that the yield from the briquettes is on average around five percent higher than that of loose chips. Secondly we reduce the volume of the raw material many times over and therefore need much less space in the store, and also the production process is markedly simpler and faster. Particularly in the charging process, a significantly higher amount can be fed into the melting oven in a shorter time.” That is the reason why practically all chip qualities are briquetted before melting at MT Comax. Only through briquetting can chip qualities, which have been purchased with residual clinging moisture, be successfully re-melted. 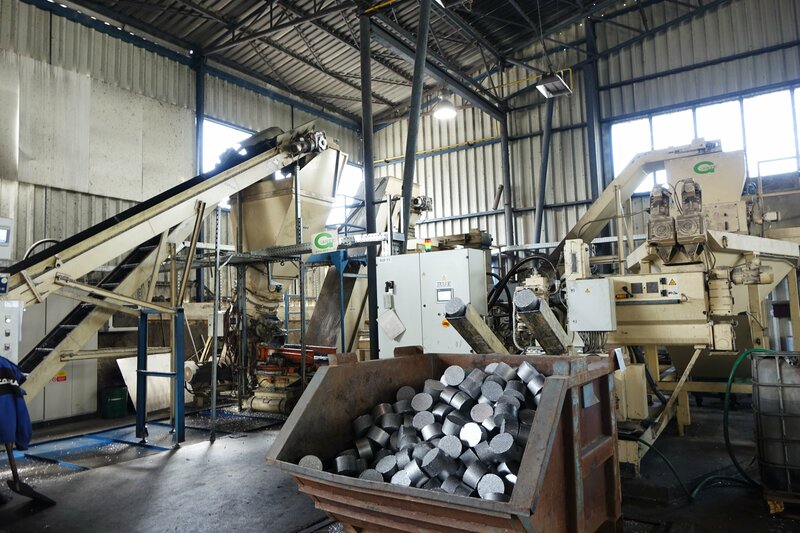 When the chips have been pressed, personnel are needed again in order to transport the valuable briquettes into a short-term store where they are stored according to type of alloy. This is important for the further logistic process, because it means the production manager’s team know exactly where to find the respective materials. They can recognise at a glance where the relevant alloy is and transport them correspondingly to the furnace. In summary this is how MT Comax produce the desired alloys with the maximum of quality and yield. Alongside the raw material and the experience of the head of melting operations, the implementation of high quality furnace technology is decisive. MT Comax makes no compromises here either and relies on a tilting rotary drum furnace. This type of furnace is considered especially beneficial in aluminium melting plants, as in general the total charging time is short and the necessary addition of salt is reduced. Therefore the specific energy requirements are reduced and the relative yield increases. This means the profitability is also increased. When the charging is completed, the liquid material is mostly cast into ingots and transported in this form to customers from the most varied branches. They are however mostly from the casting sector of automobile suppliers. They in turn use various casting processes but above all pressure die casting, to produce different products like pump casings, gear boxes, cylinder heads, clutch casings and many more. Upon request however, the Czech Refiner will deliver their aluminium alloys in liquid form. For this purpose they use transport containers with special thermic insulation and a 5 ton load capacity. A liquid metal delivery using three thermic containers thereby constitutes a delivery weight of about 15 tons per transport. Using this method saves the user from having to melt ingots themselves thereby saving on both: energy costs and valuable time. The Wacker Neuson Group started the year strong with revenue for the first quarter of 2018 increasing by more than 9 percent to EUR 371 million (Q1/17: EUR 339 million). All regions and business segments reported a rise in revenue.